In the middle of an extended heat wave, Deadstein was able to able to survive with a big band in Studio 2 at Carroll’s. Musical guests for the night included long time friend Bill Siegel, who came with his little organ to accompany us on our tunes. Also joining us for the first set was Donna who graced us with singing lead on a mellow Candyman and who also knock our socks off when she whaled through a Sugaree earlier in the set. It was almost 100 degree outside while we were playing and with 8 people in the band , most toting amplifiers, the air conditioning was having trouble getting out of the upper 70’s. The lead to a hot, sweaty jam. Initially we had a bunch of trouble with the PA system, not really able to get the Piano sounded adequate for the room. Additionally, I had trouble finding how to pickup the piano by itself in the PA recorder, so who knows how the recording for the night will work? I also had some technical difficulties during the first song of Shakedown when I discovered a gremlin in either my Fuchs Twin Reverb or my pedal board, so I switch out the amp and used a Silverface for the rest of the night, which had its tonal challenges in and of itself. Too bad, because this caused some struggles for me for the first part of the night , not really finding my comfort zone until late into the jam. While shaky, the Shakedown Street at least got us started and we were able to hear the benefit of the funkiness Bill’s keyboard brought us. Trying to think of a good 2nd song that drew Donna into the mix, I selected the Sugar Magnolia and out of the jam we went into a Suagree where Donna was able to provide us some of her Orca-esque bellowing. This is to say that she whaled during that song. We never did get back to the Sunshine Daydream, but that is not a big deal. The Masterpiece that followed was a better than usual one for us and we were tight and concise on it feeling and sounding good. The cautionary tale, as Rich put it, of the Duprees was a good time and the Cassidy that followed had Donna and I working well together on the vocals. Having Bill there, I thought it would be best to challenge him and take advantage of some of his sounds and play the Sailor Saint. Once again, this keeps getting better and better as we hone our skills and get more comfortable with the changes in the songs. When you finally finish the combo and let that final A chord ring out, you really do get a sense of accomplishment wash over your being. This was Bill’s swan song as he left us after the Sailor Saint and we took a quick short break, earlier than usual. We slowly worked our way into the Candyman, with Donna singing, initially with just Rich, Lee and I accompanying her, but everyone joined in by the end. I think that was the last song for Donna leaving Deadstein to its core constituency for the rest of the night. Following another short break, it was damn hot in the studio, we embarked on the next segment of the night which was the pre-drum type of second set. This started with a pretty reasonable feeling Terrapin out of no where into a Woman Are Smarter. Both songs felt pretty good. We then played the rarely played To Lay Me Down with the patience for the most part such a subtly sophisticated songs demands. I thought this was a really good version for us. For some reason I associate a second set To Lay Me Down with a second set Let it Grow, so I decided to head right into the Let It Grow out of the To Lay Me Down. I decided to try to play and sing the Let It Grow from memory without turning to the music in the book, which worked for me on this occasion. I was able to focus more on playing than reading which free up my mind a bit, even though I had constant anxiety as to whether or not the quickly approaching next part of the song would come to me in time to play it. This Let It Grow felt good and even experienced a relatively competent ending to the jams portions of the song. After another small break we ended playing all over the place. A little Wish You Were Here and Little I’m Free from Tommy which fell apart when it was time to leave the lyrical portion of the song. With Kevin using the tile floor as a heat exchange to get some cooling into his body, I figured I might as well play a little Good Night Irene which seemed to wake him up and get him back into the game. The Midnight Moonlight to close ended at 12:01, just past midnight and sent us packing into the 90 plus degree temperatures that greeted us when we opened the door on 55th Street. Usually getting out of the hot, sticky elevator with all six of us crammed into it and opening the door on West 55th Street, with the river just to our west, is a cool and refreshing experience, but this night the outside was just as hot as in the inside of the building. This works for us as Deadstein is always seeking both a hotter and cooler experience, so not matter which way the winds blow we end up on top, so until we freak again, Freak Out. 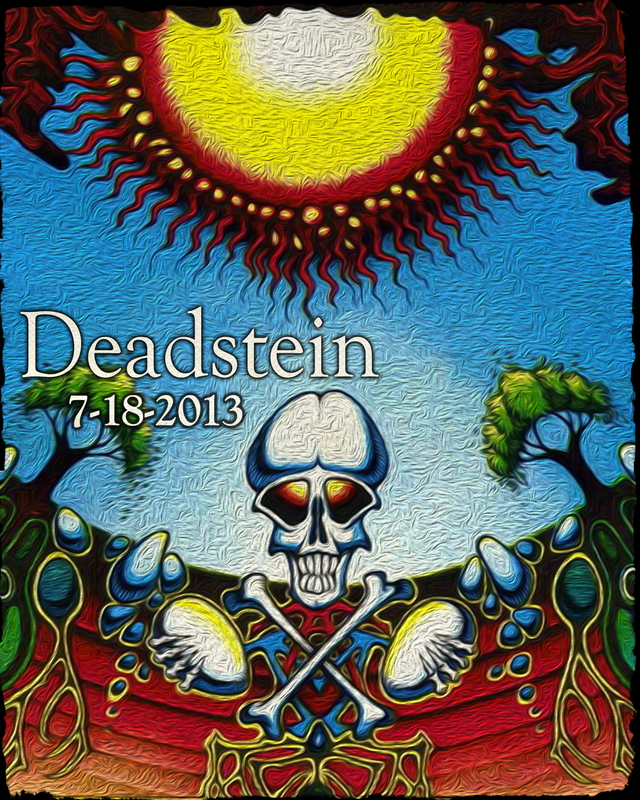 I thought this was an appropriate graphic for the blog as earlier that day the FB Grateful Dead page said the album was released that day in 1968, though Wikipedia says it came out June 1969. I’m not sure which is correct but it was still approriate as we did the rarely-played Duprees and for sure “the summer sun looked down on me”. I didn’t know about the album release, I was just thinking of the heat from the sun. Anthem Of The Sun turned 45 years old a few days ago.